NEW YORK (AP) The New York Knicks are still trying to learn how to make winning plays down the stretch, no matter the opponent. For starters, how to hold big leads in the fourth quarter. Or to make sure not to foul 3-point shooters. Or to limit easy opportunities at the free throw line. They did none of this Sunday night and still escaped with a win over one of the worst teams in the NBA. Kristaps Porzingis scored 30 points, Doug McDermott added 23 off the bench and the Knicks withstood a late push from the Atlanta Hawks for a 111-107 victory. New York coach Jeff Hornacek stopped short of feeling relieved, one night after a road loss to the NBA-worst Chicago Bulls. His team managed to hold off a fourth-quarter rally by the Hawks, who have the second-worst record in the league. The Knicks appeared to have the game put away after three straight points from Jarrett Jack and Porzingis gave them a 101-92 lead with 3:46 left. The Hawks then scored five consecutive points, including three free throws from Marco Belinelli, who was fouled as he attempted to hoist a 3-pointer, to make it 103-100 with 1:40 remaining. Porzingis answered with a quick basket at the other end to extend the Knicks’ lead 105-100 before Ersan Ilyasova’s layup drew Atlanta within three with 1:18 to play. Jack scored a season-high 19 points for a Knicks team that had lost six of eight, including a 116-104 defeat at Atlanta on Nov. 30. Despite sitting out the last eight minutes of the game, Dennis Schroder scored 21 points to lead Atlanta. Ilyasova added 20 for the Hawks, who are 3-11 away from home. Taurean Prince had 17 points and eight rebounds. Hawks: Rookie power forward John Collins, who has been out due to a left shoulder strain sustained on Nov. 30, worked out before the game at Madison Square Garden. The 20-year-old first-round pick from Wake Forest was averaging 11.5 points and 7.1 rebounds and had started four straight games before going down with the injury. The Knicks improved to 7-2 when Porzingis scores 30 or more points. The Hawks are winless in the second game of a back-to-back, going 0-6 so far this season. Atlanta has eight more sets of back-to-back games on its schedule. Hawks: At the Cleveland Cavaliers on Tuesday. 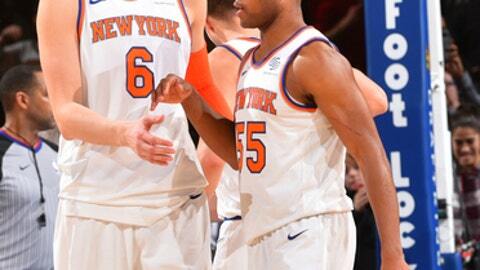 Knicks: Host the Los Angeles Lakers on Tuesday.